Destroying Iraq included the purposeful targeting of its water and sanitation systems, despite forewarnings of the unavoidable consequences and manifest illegality of attacking the health-related facilities of a civilian population. Iraq was prohibited from rebuilding even basic civil infrastructure, and this infrastructure remains ruined after nearly seven years of US occupation. 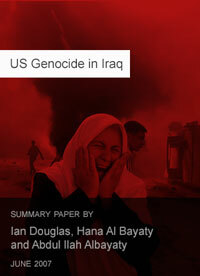 Destroying Iraq has included purposefully dismantling the state by targeting and destroying state institutions, refusing to stop or stem — or by instigating — mass looting, and by engaging in ideological persecution, contrary to protected freedoms and rights and entailing “manhunting” and extrajudicial assassination, of Baathists, the entire educated class of the state apparatus, linguistic and religious minorities and Arab Sunnis, resulting in the total collapse of all public services and other economic functions and opening the way for civil strife and corruption. In 2003, millions worldwide were mobilized in opposition to war. In going ahead with the invasion of Iraq, the US and UK governments launched an illegal war of aggression. Allowing those responsible for the intended destruction of Iraq to escape accountability means such actions could be repeated elsewhere and that world public opinion will remain unheard. To help re-establish the rights of people everywhere, legal action is vital against those who so wilfully ignored public opinion and led their countries to a war that erased over one million lives. We are indeed before immoral and unlawful acts, contrary to the basis upon which the international order of state sovereignty and peace and security rests, and contrary to centuries of political struggle against oppression. Whereas official international justice is closed before the suffering of those that imperialism makes a target, through popular, ground-up legal action we can open a channel whereby the conscience of humanity can express its solidarity with justice for victims of imperial crimes. In reality, the US-UK plan has failed. Against overwhelming violence, the Iraqi nation still resists. Our judicial action and call for further legal initiatives is in support of the right of resistance of the Iraqi people. It also gives notice that the violent aggression of the occupation is unsustainable, as are its lies. In presenting a judicial challenge to impunity, our efforts stand in defence of humanity. Defending the Iraqi people promotes justice, freedom and dignity for all.